Microgaming has released a new game to UK casino sites. Wild Scarabs is an Egyptian themed slot with 243 ways to win. Slots fans will love the fact that it brings two Wild features that could lead to some epic wins. It’s a theme that has been used many times at online casinos, but Ancient Egypt is still a beguiling setting. The mystery of the pyramid, the glamour of the Pharaohs and the dusky desert scenery are perfect for slots game fun. However, is it worth investing your hard earned cash in? Does it stand up against Egyptian-based classics like Cleopatra? Find out more about this brand new slot game, including how to play, what features it has and what you can win. 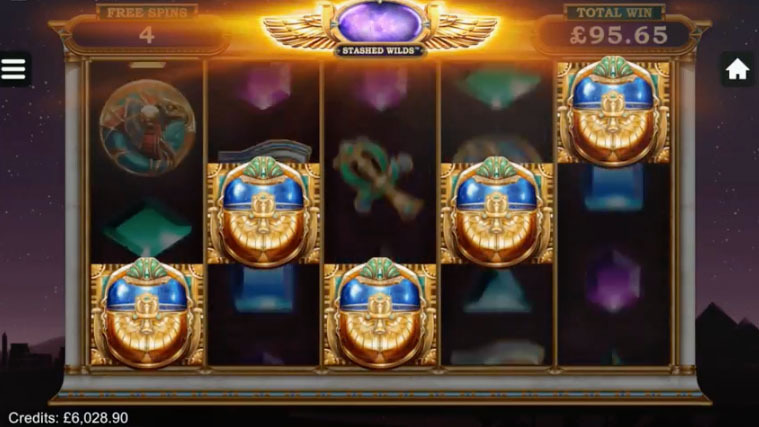 This is the Wild Scarabs new slots game preview. Wild Scarabs has five reels of three rows, and uses the 243 ways to win system. The game is available on all formats, desktop, mobile and tablet, and spins start at 20p. Simply set your bet level and begin spinning the reels. The symbols depict Egyptian jewellery, featuring the iconic image of the civilisation’s gods. Scarabs were a symbol of rebirth and regeneration in the time of the Sphinx, and they fly about the screen throughout this slots game. On any single spin, you can earn up to 1,733 times your stake. A gilded scarab is the Wild, which substitutes for anything except the Scatter in the base game. There are two main Wild features here in addition to the free spins, double the fun of many other top slots. 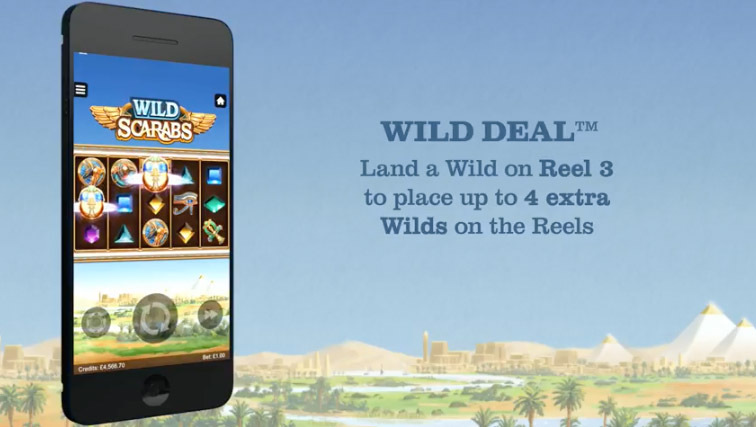 If the Wild drops in the middle reel in a non-winning spin, the Wild Deal feature kicks in. The beauty here is that up to four new Wilds drop onto the board, guaranteeing a win of some kind. Land three or more Scatters and the Free Spins Bonus comes into play. You start off with ten free plays, and this leads to the Stashed Wilds feature. During the Free Spins, if you land a Wild in a non-winning spin, you stash that Wild away. Once there are three in reserve, they return to the reels and bring you some big wins. Even better, you keep getting new spins until all the stashed scarabs hit the reels and the wins dry up. What is Wild Scarabs Like to Play? Wild Scarabs is a fun online slot, with plenty of small wins to keep you going as you wait for the big one. The gameplay is smooth, the features are exciting and the potential wins are fantastic. It looks the part, with the action taking place in front of the bright desert and the clear blue Egyptian sky. The pyramids gleam as the reels spin, bringing you closer to the big wins. As you hit the Free Spins bonus, night time descends over the Nile and you play in an atmospheric and bewitching dusk setting. When the reels are spinning, you are transported to the Valley of the Kings, walking in the footsteps of the great leaders from history, like Tutankhamun and Cleopatra. Wild Scarabs is a premium new title from Microgaming, one of the world’s biggest game developers. As such, you will find it at most UK casino sites. Head to Casumo or Royal Panda now to play the Wild Scarabs Egyptian themed slot. Microgaming developed the software for the first ever online casino in 1994. Ten years later it was at the forefront of mobile casino play too and is one of the largest gaming concerns going. Headquartered on the Isle of Man, it produces big new titles on a regular basis, with a reputation for quality and success. It is responsible for some of the biggest slots games on the market, including Jurassic World, based around the popular dinosaur film, Immortal Romance, a vampire-based adventure, and Thunderstruck II. The latter is a Norse mythology-based game, which is another of the most popular settings for iGaming titles. The world of mummies, hieroglyphics and the Nile has transfixed gamers for years, and Wild Scarabs is just the latest slot in the tradition. Microgaming has visited the era in the past with Throne of Egypt, for example. Some of the best known Egyptian slot games are the Cleopatra titles. These games first appeared in land based casinos before transferring online. Maker IGT has released a number of titles in the series and it is still a popular choice at UK casino sites to this day. There is also an Egyptian version of the progressive jackpot slot, Mega Moolah, called Mega Moolah Isis. If you would like to play Wild Scarabs today and take advantage of those two big Wild features, visit Rizk Casino right away.